Ed Horton ran a shipping business; owned a wagon, a buckboard and a string of mules that he staged between Yuma and the mining town of Hedges. He also owned a saloon, served as the town constable and undertaker, and in his spare time worked at his blacksmith shop. Ed Horton would tell of his years on the desert to anyone who would sit at the bar long enough to hear him out. One particular story that he told with some regularity regarded a gold ledge discovered and lost by a man named Jim Sullivan who once worked at his saloon as a floor man or bouncer. 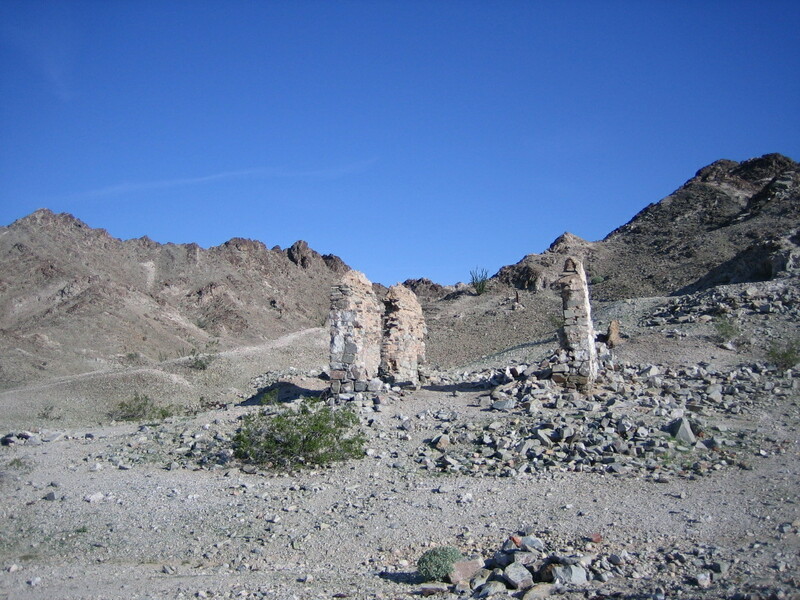 That story along with many others took place at an isolated mountain range situated in the southeastern corner of Imperial County. 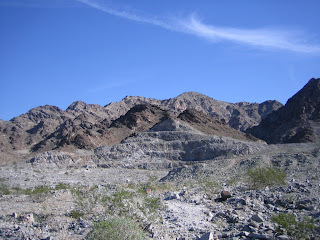 A range that may have been the scene of the first gold discovery in California. 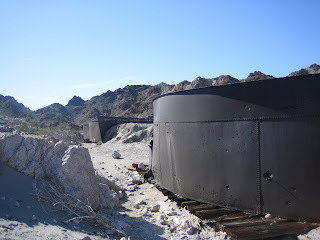 Some believe that the Spanish mined gold here before the Yuma Indian uprising of 1780. Legend has it, that two Mexican boys filled their pockets with bright colored pebbles that they pick up while playing in a sandy gulch. When the boys returned to their camp, it was found that the bright colored pebbles were pure gold and the mountain range then became known as “Loaded Boy” -- Cargo Muchacho. During the 1880s, a settlement called Gold Rock mysteriously arose at the edge of the Cargo Muchachos. Almost over night, tents and loosely hinged clapboard buildings appeared around the workings of Peter Walker’s mining camp. As with most mining camps of that time, the swarm of prospects soon thinned to a few producing properties that formed the Ogilby Mining District. At first, the ore was shipped to a mill at Winterhaven on the Colorado River. Then around the mid 1880s, a twenty stamp mill was constructed and a pipeline was laid to bring water from the Colorado River. During the next few years, the free-milling ore paid wages and gave the mine owners a fair return on their investment. But as the ore bearing ledges dipped deeper into the earth, the cost of recovery became too great for the individual mine owners to handle. Deeper shafts require engine driven hoists and larger mills for grinding and coaxing the finer grains of gold from the waste. All of these expenses required organization and investment from outside sources. As a result, Walker and the other individual operators at Gold Rock sold their properties to the Gold Cross Mining and Milling Company. With the backing of some wealthy investors, the company began sinking deeper shafts reaching a better grade of gold bearing ore and bringing mining equipment in by the train load. The number of stamps increased to 40 and then increased again to a total of 100. And, before turn of the Century, a total of 140 stamps were busy pulverizing tons of material extracted from extensive underground workings. The work force expanded and the camp population grew. 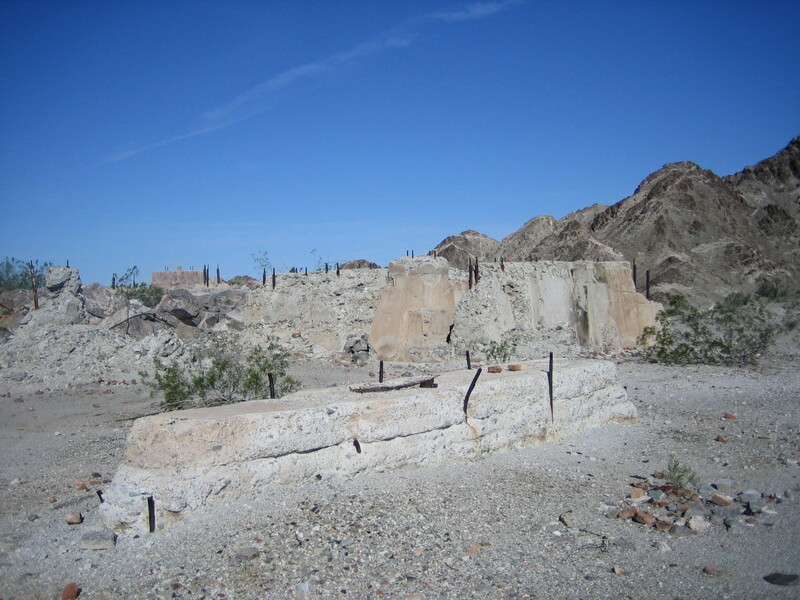 Gold Rock became “Hedges”, a company town operated for the sole benefit of the company. As one miner put it, “It aught to be called the white mans slave company”. The town spread out some distance east to west along the road that led to the railroad station at Oligby -- skilled white employees and managers lived along this stretch. The less respectable and hard-living folk dwelled in another part of the camp where saloons housing illegal gambling and backroom-sporting-women crowded both sides of the road. In early western tradition, shootings, knifings and other mayhem happened here with some regularity. Guns and low grade whiskey made this a dangerous place to spend ones evenings. Billy Hortan, part owner of the Stingeree Bar and Grille, on one occasion, while in the act of breaking up an argument at a card table, got himself pinned against the wall with a knife held against his arm. Hortan’s partner Adams, who was tending bar got his gun from under the counter and with one shot dropped the knife wielding gambler. The coroner’s jury justified the death as self defense. In order to get ones attention in Hedges, something really dramatic had to happen. Like what happened at Wilsons’s Saloon on December 16, 1895. That night, the bar was crowded with prospectors and mine workers. A man named Mulachy stood at the bar talking with two brothers Juan and Tirco Gonzales. Late that evening, a tall lean prospector named Henry Randolph entered the bar and took a table. Mulachy walked over to Randolph and accused him of killing his partner and jumping his mining claim. Randolph, after an exchange of words, stood and delivered a punch that sent Mulachy sprawling to the floor. Watching from the bar, Juan got excited, pulled a gun from his pocket and fired a shot missing Randolph who had started backing towards the front door. Randolph returned fire hitting Juan in the stomach. As Juan fell his brother, Tirco, twisted the gun from his hand and fired two shots again missing the retreating Randolph. Outside, Randolph fired back through the door at Tirco who fell dead tripping over a stack of whiskey barrels. Then, like in a low-budget western, Juan staggered to his feet and pursued Randolph out of the saloon and onto the street wildly firing at him as he faded into the night. Juan died the next day of his wound. Randolph, after being found not guilty by reason of self defense, continued prospect in the Cargo Muchachos where he filed on numerous mining claims. The Mexican cantinas had their share of misadventures. According to the Arizona Sentinel, Joaquin Fuentes was convicted of manslaughter for knifing a drinking partner because the partner refused to eat some watermelon. Wow. By 1900, only a hand full of workers remained at the mines and Hedges began to take on the aspect of a ghost town with vacant buildings, crumbling shafts /tunnels and rusting machinery. Then in 1910, The United Mining Company purchased the properties and renamed the town Tumco. Activity returned with the sights and sounds of mines and mills returning to the job of producing gold. Production came principally from large steel vats in which the cyaniding process took place. The mines continued to operate until 1916. Back to the story of Sullivan’s lost gold as told by Ed Horton. An Indian, whose name had slipped from history, asked Jim Sullivan to make him a crucifix like the one attached to his watch fob. Jim agreed to do so if the Indian would take him to a fabled ledge of gold held secret by the Yuma tribes. The Indian eventually agreed and the two headed east out of Hedges toward the Pebble Hills, a low range that lies between the Colorado River and the Cargo Muchachos. The ledge that they found proved unbelievably rich in free-gold. After taking a few samples and preparing to return to Hedges, Sullivan suddenly became aware that the water in the cans that they had brought with them was polluted. The cans had held kerosene and had not been properly cleaned before being filled with fresh water. Sullivan, angry at himself and frustrated by his situation, drew and fired his pistol unloading all six rounds into the two kerosene cans. He and his Indian partner then packed the samples and started their journey back to town. They had been gone only three days but desert heat and dehydration took its toll on Sullivan who spent the next few months recuperating in a Los Angeles hospital. The ore samples tested over $1,000 a ton in free-gold, a fabulous discovery for this part of the desert. When Sullivan returned the following winter, the Indian could not be found at Hedges or at camps along the Colorado River, or on the Yuma Indian reservation. It was believed that he might have been banished by his fellow tribesmen for taking a white man to a sacred place. On three different occasions, Sullivan unsuccessfully searched for the ledge that remained fiendishly hidden. This story has been told and written about over the years and widely circulated among treasure hunters. As of this writing, neither the bullet riven kerosene cans nor the gold baring ledge has been found but I am sure that the search will continue. My photographs shown from top to bottom -- a terraced open pit area; a platform that held a bank of ore stamps; a row of large metal cyanide vats; ruins of the only standing structure. 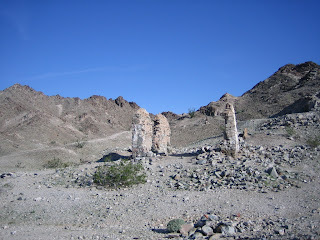 Tumco can be reached from Interstate 8 by taking Highway S34 off ramp north about nine miles to a dirt road that trends east and leads to the ruins. (Goggle Earth at 32, 52.790; 114, 49.309.) A parking area and a visitor kiosk are located at the end of the road, complements of the Bureau of Land Management.